Docent Alfred Escoffier will show slides and discuss Gods in Color. 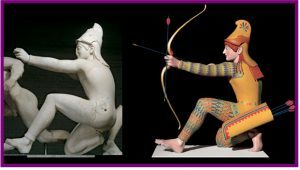 This stunning show offers a look at classical sculpture swathed in its original vibrant colors, questioning the perception of an all – white “classical” ideal. Ancient sculpture and architecture are revealed as intended — garishly colorful, richly ornamented, and full of life. This exhibit runs through January 7, 2018, California Palace of the Legion of Honor, San Francisco. Note: FAL-sponsored docent talks fill up quickly, so please arrive early.